Total Craft Time: 10 min per heart. Take a 3x3 inch piece of thick craft paper fold it in half. Draw half of a heart and cut it out. Think middle school girlies. When you unfold the paper, you will have a cute and symmetrical heart. 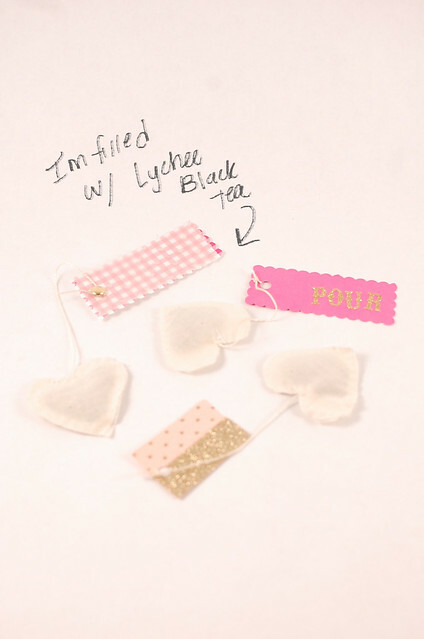 Place your heart template on your muslin and lightly trace in pen. Cut out your hearts but make sure you cut just inside your pen marks. Who wants inky tea? Thread your needle and sew the heart 3/4 all the way around. I usually start on one side of the heart's crack so to speak. I'll go over the hump, down the side, up the other side and just before it starts to hump again, i'll stop. Take your needlepoint thread (about 10 inches) and knot one side about 4/5 times creating a big knot ball. You might also want to take some of your yarn and pour boiling water over it to see if the color will run. I got my colored thread from Jo-Anne's and did not have a problem when I tested it. Any who, this knotted ball will essentially be sewn into the heart with the tea. Put the big knot inside with the tea and continue to sew your heart up. Make sure you sew tightly around the knot so it the string doesn't slip out. Create your own cutsey tags to attach to the other end of your needlepoint thread. I used a scalloped pair of scissors to make them look like little biscuits. I also make them oversized to give them a whimsical feel. 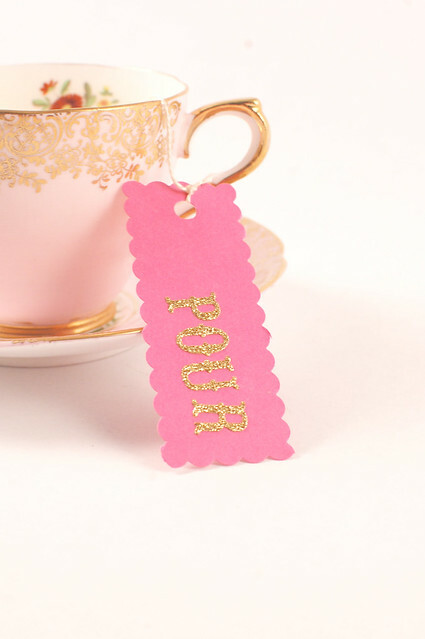 For some of my tags, I used glitter letter stickers and made tags that said cute stuff like: jig, pour, wink, fizz, xoxo, and bloom. Bring water to a boil, steep and enjoy! Adorable! I can't wait to try it myself. You have the best ideas! Thanks Cathy!They were really fun to make! For when square tea bags just won't cut it. I absolutely adore these, such a wonderful gift idea. 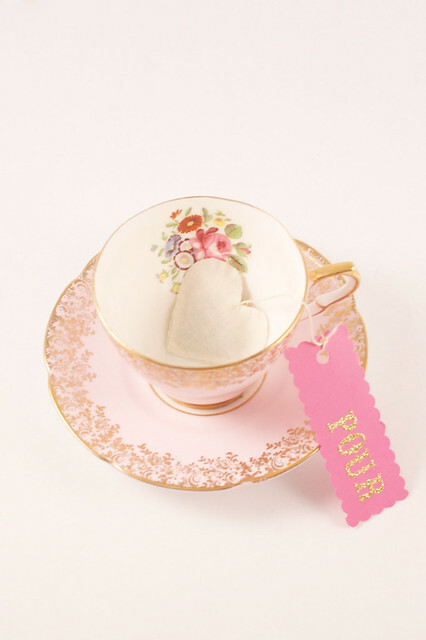 Also that teacup and saucer are just gorgeous.